Unlike a printed newspaper; online news, comments and social posts can last forever. In an age where information is shared online in an instant; individuals and companies are now finding that personal data, comments and articles are stored indefinitely and published online for the world to see. 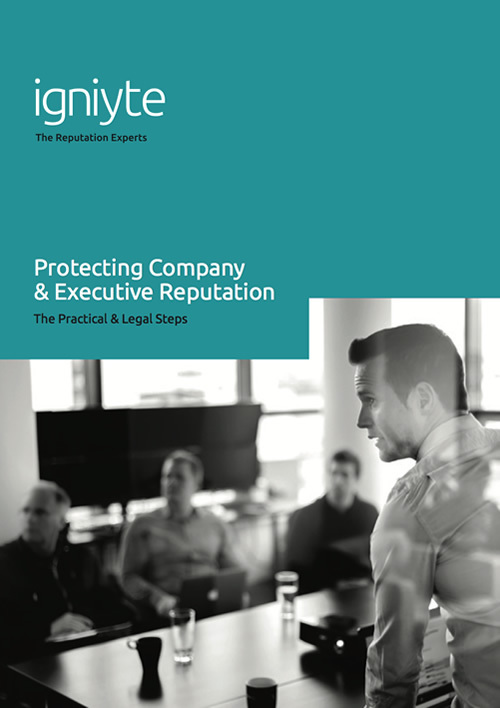 Protecting company & executive reputation is now more important than ever before. A company can easily control the information that appears on its own websites, blogs and social profiles, but there are a growing number of users on forums, social platforms and review sites along with bloggers, whose comments and opinion can rank so highly in the search results that they are causing companies serious financial harm. It isn’t unusual to see negative reviews, news stories and blogs ranking on the first page of search results and this is costing companies around the world not just financially, but in terms of their brand reputation too. Countless pieces of research have confirmed the strong correlation between company reputation and financial success. A Weber Shandwick report also found that CEO reputation is an invaluable corporate asset, with executives commenting that on average, 49% of the reputation of their company was attributable to their CEO’s reputation. Increasingly, a CEO’s and a company’s reputation can be damaged and improved online. Due to the instant and wide-reaching nature of the internet, this is where most conversations are happening and offline issues can easily make their way online. There can be confusion within companies around whose responsibility it is to deal with defamatory or unsubstantiated content online. Is it the responsibility of the marketing team? The public relations team? Or the legal team? And how do you know when to deal with online content, when is it potentially damaging? 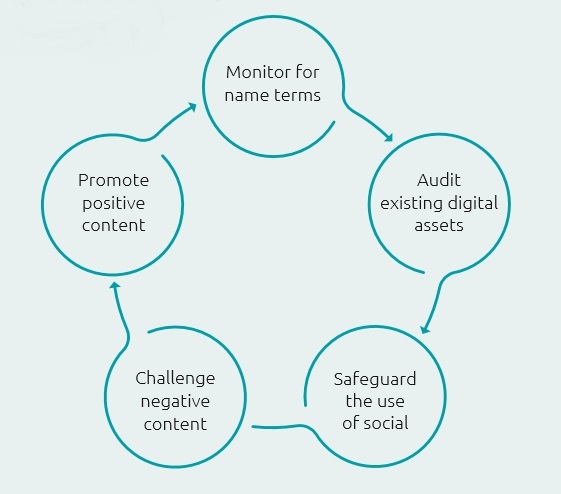 To avoid and limit the reputational and financial damage of negative online content, companies need to ensure that they’re prepared to identify and combat the damaging content as quickly as possible and that the right people take the right steps to challenge it. Some content is fine to be left alone, some content might need legal assistance to challenge it. There’s a tangible difference between accepting negative commentary on forums and social media and dealing with corporate trolling or threatening online behaviour. It’s every business owner’s responsibility to ensure that processes are in place and understood by employees as to how to escalate online issues and deal with them effectively. This guide will demonstrate how to spot a potentially damaging piece of content online, how to deal with a crisis when it hits to limit reputational damage, how to prevent a crisis in the first place, and the legal and practical options available to challenge content online. Monitoring sentiment online: Who is talking about you and where? To be able to identify online content issues and deal with them before they escalate; it’s important to monitor what customers, potential customers, journalists, competitors and others are saying about you online. Setting up Google Alerts is a quick way to do this, you can create alerts for your company name and any related keywords and you’ll be notified when they’re used online. You can also do this by ‘social listening’; paying attention to what is being said on social media networks and industry forums, too. You can do this manually or a better option would be to invest in a social media monitoring tool such as Brandwatch, which will alert you to all mentions of your company or company executives on social media. Monitoring social media networks and any related blogs is especially important for consumer-facing companies. Being aware of mentions of your business online will help you to identify what your customers are saying about you, when they are communicating and the channels that they’re using to do so. As well as enabling you to engage with your audience online, monitoring the online conversation allows you to spot a potentially damaging comment or issue as it happens – allowing you to take action immediately before it escalates. Once you have processes in place to monitor the conversation about your company; you need to know how to effectively measure progress. To be able to do this, you need to establish what’s ‘normal’ for your company. Look at the online mentions over a period of a few months and work out an average percentage of neutral, positive and negative comments. If, for example, on average you receive 75% neutral comments, 20% positive comments and 5% negative, and this split starts to alter in any way – you might be able to relate this back to certain situations or events within the company, or you might be able to identify it back to a certain forum post or press article. Share this information not only with the marketing team, but with the wider team too – business operations, sales or customer services – online comments are often complaints that haven’t been handled well. Google Alerts is a great, free tool that can be set up by anyone, but this won’t always pick up individual social media posts and if your company has a large online audience, you’ll need to monitor sentiment by social platform, territory (if it’s a multinational company) and subject matter. Don’t just concentrate on negative posts; in reporting social activity and sentiment online, the object should be to increase positive mentions. Negative mentions are often a result of poor customer service or business operations. Unless these companies improve their processes and services; it’s likely that the same level of negative comment will remain or increase as their audience is grown online. By understanding what’s ‘normal’ for your company or company executive online, any changes in negative sentiment should be easily identified. By monitoring and evaluating this online conversation; you’ll gain an understanding of how your product or service is perceived in the marketplace and whether you’ll need to take steps to improve its positioning. Consumer-facing companies should proactively manage reviews and ensure that they deal with reoccurring issues that customers are commenting on. Failure to handles a customer complaint will most likely result in losing them for good. Many companies are still failing to respond to complaints on Twitter, but this is potentially a big mistake. Companies should look to respond to every complaint as quickly as possible. Show respect: Dealing with customer complaints can be hard if they’re being particularly rude or aggressive, but make it clear you want to resolve their issue and accept where there may have been errors from your company. Try not to pick an argument or try and prove the client wrong. Be personal: Don’t copy and paste a standardised, impersonal response as this will only fuel the customer’s frustration. Look to resolve the issue and apologise for any mistakes the company may have made. The more personal you can be with the customer, the more satisfied they will be that they’re being listened to and the issue is being sorted. Be professional: Whilst you should be personal with every customer, remember to remain professional as well. Retain the company’s credibility when responding to a negative social media post or online review. Remember that comments online can be seen by a wide audience and influence potential customers so make sure you don’t say anything you wouldn’t want them to see. Don’t cheat: It might seem like the simple option is to post positive reviews about your own company or remove negative ones to make your company look better, but this just doesn’t work. It’s more obvious than you might think when a company has posted a fake review about themselves and they’re almost always caught out. By deleting negative reviews, it shows a lack of transparency and honesty from your company – this won’t solve any long-standing issues or improve your company’s reputation. Try to move the issue offline: Playing out the complaint in the public domain could cause further problems for your company, so ask the customer publicly to send a private message or their personal email address so you can carry on sorting out the issue offline. https://www.google.co.uk/alerts – Set up a Google Alert for key terms including the company name or key individuals within the organisation. You’ll receive emails with links to any mentions online as they happen. https://www.brandwatch.com/ – Brandwatch is paid-for software that provides comprehensive reporting and dashboards showing where and who has posted content about the company. http://www.icerocket.com/ – Allows you to monitor Twitter, Facebook and blogs for specific search terms. http://socialmention.com/ – Provides reporting and monitoring for named search terms. https://hootsuite.com/ – You can effectively manage your social media through Hootsuite and also evaluate how your campaigns are running and who is interacting with you. If your company is well prepared for a crisis situation online; then an effective response strategy can be implemented which will lead to quicker recovery and limit the damage. There are particular industries and individuals who are more vulnerable to crises; financial institutions, transport and logistics companies, pharmaceutical corporations, oil and gas companies and international brands. Who has seen the negative post / tweet / comment / article? If one person has tweeted negatively about you and they only have 30 followers, don’t waste your time on this – it likely won’t cause an issue for you. Is the content increasing and gaining in volume? If more posts and comments are appearing, then quick reaction is key to try and stop them increasing – this is where a reaction plan comes into play. The UK press is notoriously high ranking and influential online – as soon as the press pick up on a story, a company statement will be required and often warrant a crisis plan in full action. When a company is facing a barrage of online comments or opinions, or increasing press, it can be very difficult to rise above the noise of a negative crowd, protecting company & executive reputation. Any attempts to push out positive press or positive social media activity isn’t usually well received and can encourage more backlash. It’s incredibly important that the staff managing a company’s social media activity shouldn’t be responding to questions unless a communication plan has been agreed and there are guidelines as what the company should or shouldn’t say. Short statements are good, along with apologies – “We’re sorry” goes a really long way. You don’t have to admit to anything but apologise for confusion or for not keeping consumers / your audience informed. Use your social media profiles to signpost people to an empathetic company statement and be consistent with messaging online and offline. Lack of clear communication not only to customers but also to staff and stakeholders can lead to lack of trust and huge damage to reputation. You can’t always avoid a crisis completely; but you can certainly limit the damage it has on your business. By having a crisis communications strategy in place, you can prevent further damage to your reputation in the event of a crisis by handling communications in an appropriate manner. A crisis communication strategy should work to ensure that everyone is clear on what to do and when to do it when a crisis hits. Applying this level of organisation within the strategy ensures that there is one person accountable and responsible for every step of the plan. The way in which businesses communicate in a crisis has proved, more often than not, to have an impact on their overall reputation. Similarly, if the content has been posted on a review website, blog or forum; check to see if the content contradicts the site’s guidelines and contact the site directly reporting the content as soon as possible. The potential damage to your company depends on a number of factors, including the volume of negative posts and the audience they’re reaching (which is determined by where they’re posted and how high these sites are ranking). One bad Facebook post can be buried easily with a few positive posts and the user needs to be monitored, this can be handled effectively by your social media team. If more users join in on that post and comment, it’d be a good idea to respond politely – apologise if it’s a complaint, and then monitor that user. If those users then begin to tag and copy in more people and also start to post out on your other social media profiles, you might start looking at escalating the activity internally. If the volume of posts is growing – prepare a statement and try to contact the author of the content directly. If content or comments are becoming threatening or abusive, it’s a good idea to consult with an IP or media lawyer. With press articles, if you’re concerned that a journalist is harassing you or your company or breaching the Editor’s Code, you can complain to the Independent Press Standards Organisation (IPSO). Of course, you can’t always avoid a crisis completely because there are a number of elements you can’t control – such as someone external posting something negative online – but there are steps you can take to reduce this risk as much as possible, and limit the damage when the crisis hits. Monitor online conversation: As we’ve covered, monitoring what’s being said about you online is essential to spotting a potentially damaging comment or post which you can then deal with immediately. Create a crisis management plan: Detail the actions which should be taken should a crisis hit, what role should everyone play and when should they action it? At the minimum, your crisis management plan should include a prepared statement to the press, a nominated spokesperson, a social media plan, and prepared communications to staff, shareholders and customers. It might seem like overkill if you’re a small company but it’ll be more than worth it if the situation arises. Communicate the plan to everyone internally: Ensure that everyone in the company is aware of the plan and what role everyone has to play when it’s implemented. You want to avoid a situation where a crisis hits and everyone’s panicking, not knowing what to do, this wastes precious time and could make the situation worse. Train all staff in customer services: Again, this might seem like overkill if you have a dedicated customer services team, but you need to ensure that the same, consistent brand message is being represented from all areas of a business and that everyone is working to the same culture. In particular, your social media team should be trained in the same way as your offline customer services team. All members of staff should know what the customer service process is, too, so that everyone knows exactly how and where to pass an issue to if they spot one. This makes sure that the customer experience is positive, meaning there’s less chance of negative comments on social media and on review and forum sites. We’ve touched a lot on the importance of a positive customer experience and how online comments from customers can damage a company; but equally as important, is your internal communication strategy. A crisis can just as easily (and as some research has shown, is more likely to) come from internal staff. You can take steps to prevent this risk as much as possible. As the reputation of key executives within the business will contribute to the overall company reputation; it’s important to manage their reputations, too. Make sure that you’re monitoring not only the conversation surrounding the company, but key executives too. Ensure that their own personal social media profiles and any other online profiles are monitored regularly and that there’s nothing offensive or defamatory on there that the press could potentially pick upon if the company finds itself in a crisis. Keeping staff morale high is not only important for better efficiency and internal processes; but it’s important for company reputation too. Your staff are your biggest brand advocates and potentially a powerful marketing asset. By keeping a strong internal culture and managing staff well, you’re less likely to get a disgruntled employee letting off steam about your company on social media, for example. Whilst you might trust your staff enough to use their common sense whilst using their own personal social media accounts, it’s not worth taking the risk – implementing a clear social media policy for all members of staff minimises the risk of something unwanted appearing online. There have been too many recent high-profile examples of staff speaking inappropriately about their company on social media, or just posting something totally unrelated to the company but something offensive or defamatory to others. You can’t control what your staff do on their own time on their own personal social media accounts, but you can advise them of best practice and make them aware of the consequences for both themselves and the company of posting inappropriate content. Speaking about the company: Set guidelines on what staff can and cannot say about the company online – even if they speak about the company indirectly. Even a negative comment about their day at work can be picked up by the press if the company is high-profile enough. Speaking about clients or customers: Make sure that your staff realise that their social media profiles can often be accessed by anyone, including clients or customers. A flippant comment about a particular client could cause huge ramifications for the future of that client account. Posting offensive content: Even if the content posted isn’t about the company, an offensive, racist or defamatory comment for example, could get picked up by other social media users and the press and reflect badly on your company. Posting confidential information: With the rise in popularity of social media, people are being much more transparent and open with their personal and private lives than ever before. You need to ensure that staff remember not always to be so transparent with information at work – any private or confidential information posted online could lead to a data breach. The Defamation Act 2013 says that a statement is not defamatory unless its publication has caused or is likely to cause serious harm to the reputation of the claimant. For a company, serious harm relates to serious financial loss. If something defamatory is posted about you or your business online, firstly, try to find out who the host of the website is and try to contact them directly and request that the content is taken down. If they refuse or fail to reply, you can then take the legal route and sue for damages. In a UK court of law, it would be down to the defendant to try and prove that what they’ve said is true. Any online content published in the UK is subject to defamation, privacy and contempt laws. Trolling is a term coined in the last few years that most people are now familiar with. Similar to online harassment, trolling is when a person deliberately upsets or provokes a person or people into an emotional response by posting insulting, extreme or obscene content online. Currently, there’s no clear definition of trolling and what differentiates trolling from freedom of speech, but certainly reported instances of online abuse are growing and the British legal system is dealing with them, with internet trolls facing two years in prison. If your company is being trolled or harassed online, it’s advisable to take legal advice rather than try to deal with the situation yourself. In May 2014, the European Court of Justice ruled that links to inadequate, irrelevant and outdated content in Google’s search results should be deleted on request. The actual content itself does not have to be deleted, but a link to it from a Google search should be deleted. The ruling was a victory for European protection of personal data, however Google stated it was disappointed at the result and stated removing data amounts to censorship. Regardless, almost 220,000 requests had been made to Google in the EU up to March 2015, and 48% had been granted. If there is outdated or irrelevant information about you or your company online that ranks for your name or company name in a Google search and you would rather people did not see it, you can request to Google that it be delisted. However, remember that Google reviews each request manually and will take a view on whether the information is in the public interest or not, so if the information listed relates to a legal matter for example, it may not be taken down unless it’s outdated. Generally, you only get one shot at applying for the right to be forgotten and it’s important that you get your request right. We’d strongly recommend you seek professional reputation help before sending your request, as if it’s denied, there’s little you can do to get the information delisted. What customers, potential customers, stakeholders and staff see about your company online could be hugely influential as to how they perceive you. The importance of the online conversation surrounding your brand is growing, and can have a direct impact of the success of your company. The necessity to control as much of the conversation as you can and manage and monitor the conversation out of your control has never been greater. It’s not just about getting on top of any negative content and responding to reviews, but it’s about utilising as many online channels available to you as you can to promote a positive presence of your brand online and encourage custom. As this guide outlines, there are a number of practical steps you can take yourself to combat any unwanted or negative information about your company online, but there are some instances where you should absolutely take legal advice rather than trying to rectify the issue yourself. 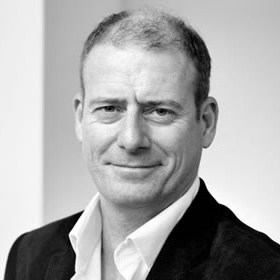 As an established, leading reputation management company, Igniyte manages many online brands internationally – leading, controlling and encouraging positive conversation about them on the internet. We partner with a number of legal professionals to consult on defamation and libel cases; and we’ve been extremely successful in repairing and building positive online reputations for our clients.